Well-drained soil with plenty of well-rotted organic matter. Full sun to partial shade. 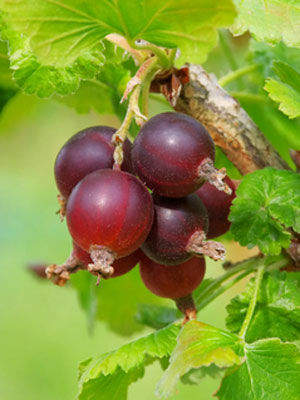 Like currants and gooseberries, jostaberries make good bushes for garden boundaries. Unlike gooseberries, they have no thorns. Developed in Germany, jostaberries are extremely cold hardy. Topdress with well-rotted organic matter in spring along with a balanced organic fertilizer. Keep the root zone mulched to retain soil moisture. Gooseberry. Jostaberries grow best when planted together in small groups. Plant in mid spring while dormant. Incorporate plenty of well-rotted organic matter into the planting hole. Each winter, remove the oldest canes from established plants, and clip of damaged or drooping branches. Healthy jostaberries will bear for ten to fifteen years or more. Harvest when fruits turn blue-black and are firm. Freezes well. Net to prevent bird damage.